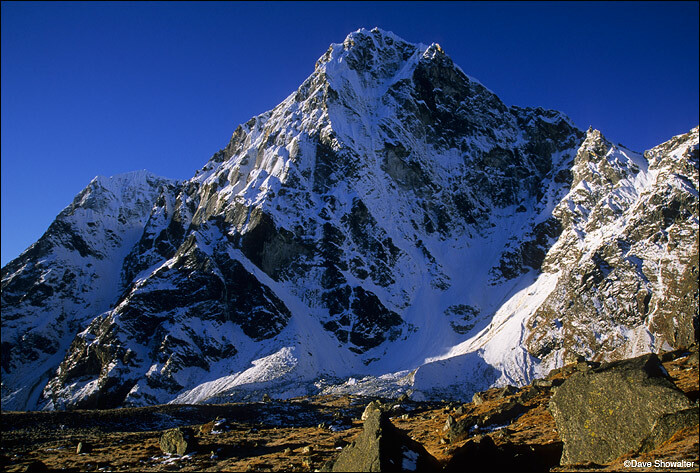 Cholatse, 6440 meters (21,128 feet) towers over Dzonglha, our camp after crossing Cho La Pass. Although Cholatse isn't tall compared to surrounding Himalayan giants, it wasn't climbed until 1984 by a party that included Vern Clevenger, Galen Rowell, John Roskelley and Bill O'Connor. Photographing Cholatse from here was tough - I really wanted a wider angle lens because the enormous peak was right over head. I'm struck by the quality of light on this particular Himalayan morning. Photo © copyright by Dave Showalter.